Last week, we were awestruck watching the last three minutes of the National Football Conference Championship game between the Seattle Seahawks and the Green Bay Packers. My son, 15, and I watched Russell Wilson score a touchdown and get a two-point conversion to take the lead. But then Aaron Rodgers and Mason Crosby countered with a field goal only to have Wilson throw a game-winning touchdown in overtime for the Seahawks. Football is not just a game of strategy, but it is counterstrategy, execution, recovery, calibration, recalibration and then again strategy and execution -- all in 24-second cycles. So what makes this possible? We pondered, why is football so different from other team sports like soccer, baseball or basketball. We believe it has to do with one transformative activity, the huddle. Only in football, does a team, every 24 seconds, gather to plot their offensive attack. The offensive team has short-term goals, the first down line; the long term goal, the touchdown; and reach goals, a game-winning strategy. The defensive team prepares for the counter. 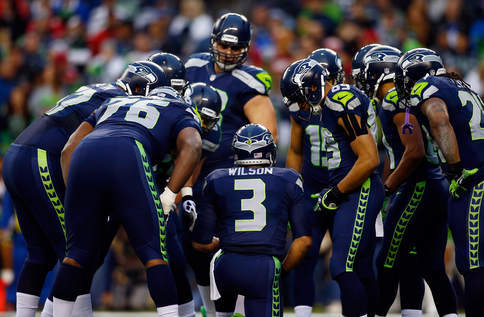 The plotting is done in the huddle, in a brief five to ten seconds, with players looking each other in the eye and their leader, the quarterback, taking signals from the sideline, providing instructions and an execution plan. In the huddle there is no time for a conversation, deep reflection and discussion. Businesses too have taken on the concept of the huddle. Donavan Roberson, a business consultant, in his blog writes, "The huddle is a key element ... that speaks to importance of the team by communicating vision, providing clarity and demonstrating unity." Even hospitals have taken on the concept of the huddle. Since 2013, Advocate Health Care, one of the largest U.S. health systems, has banned 7:00 to 9:00 a.m. meetings, allowing time instead for 15-minute team huddles. This has allowed them to identify 40 percent more patient safety concerns. On the floor, nursing teams gather and discuss safety and quality issues that may have occurred in the past 24 hours and which may occur in the next 24. In the surgical suite there is no need for a huddle. The surgeon, the scrub nurse and the anesthesiologist are in a constant huddle over the operative field, with the patient draped underneath. So hospitals has adopted another sports strategy, the time out. In nearly every hospital in the country, a "time out" is taken immediately before starting the procedure to perform a final check to make sure that the correct patient is about to undergo the correct procedure, on the correct site. Studies have shown that a timeout reduces wrong-side surgeries and improves the communication among the surgeon, anesthesiologist, the scrub nurse and the assistants. The huddle is successful for many reasons. First and foremost it is direct personal human-to-human, eye-to-eye contact. It is a powerful way to unite a group of people. It is instructive with each team member knowing his or her role and how to follow through with it. And if one fails, he or she is held accountable by a face-to-face in the next huddle. Now, it's ironic, in football, how the "no-huddle" itself has become a new strategy, to catch the defense off guard and not allow them to plot a counter strategy. A plan decided in the preceding huddle by the offensive team. Let's see what strategies the Seahawks and Patriots come up with in the Super Bowl which is sure to be exciting as 100 million Americans look on, and see the power of the huddle.